Order cool Marc Breuers-Team Sunoco gear! Marc is hoping to put together a deal that would put him in the driver's seat at Team Rahal, owned by three-time Champ Car champion Bobby Rahal (inset) and one of the most high-profile teams in the CART Toyota Atlantic Series. Marc Breuers has proved that he knows his way around a racetrack. Now he has to show that he can navigate the financial circuit as well. 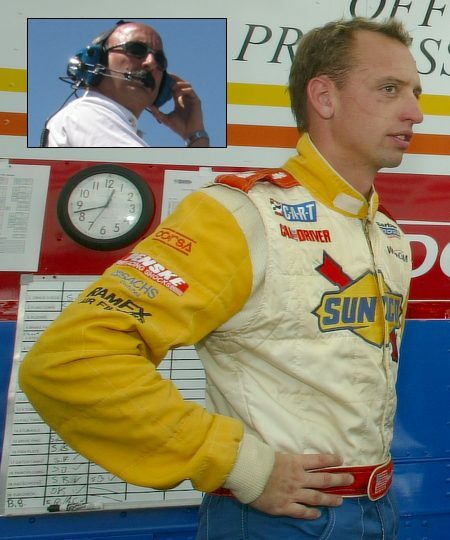 Bobby Rahal, one of the most successful American open-wheel racers, was impressed enough by Breuers that he has invited the Gladwyne resident to join his stable of drivers. "I can't emphasize enough what a great opportunity this is for me," Breuers said. "It gives me a chance to put myself in front of Bobby for a [potential] Champ Car ride, to work with his team to get something ready for next year. My goal is clearly to go to the Champ Car Series next year." However, to become a member of Team Rahal, Breuers must secure enough sponsorship to field a car in the Toyota Atlantic Championship, a proving ground for CART's Champ Car World Series. The step up in competition also means a healthy increase in cost. The typical annual budget for a Toyota Atlantic car can reach $1 million, compared with the $200,000 Breuers spent last season in the Barber Dodge Pro Series. "He's got to go out and hustle, and I know that he's working hard on it," Rahal said. "Unfortunately, that's the nature of the beast, especially for drivers at Marc's stage - where you've got to show the world that you can do it. Then, hopefully, later in your career you don't have to find the money on your own." In a perfect world, sponsorship money would fall from the sky today and Breuers would make his debut in Long Beach, Calif., on April 13 - three days after his 28th birthday. "That would be a great birthday present," Breuers said with a laugh. But while he feels he's already behind schedule, his soon-to-be boss knows that the timing has to be right. "Even though these young drivers want to get in and drive - and they should be that way, they should be impatient - the worst thing to do is to rush it," Rahal said. "I think the first race we'd be looking at would be Milwaukee [on May 31]. That would afford us enough time to practice and to get the car set up properly." Rahal knows the value of patience and setting long-term objectives. He retired from driving in 1998 after three CART championships, 24 victories and 177 top-10 finishes in 264 starts. He had already established himself as a team owner and lured television talk show host David Letterman as a partner. Rahal even served as CART chairman during the recent transition period. Now he is an owner in three American open-wheel series. Last weekend gave evidence of the strength of Rahal's program. Michel Jourdain Jr., 26, of Mexico, posted his second runner-up finish of the Champ Car season on Sunday in Monterrey, Mexico. At that same course, 21-year-old American Danica Patrick - the first female to compete full-time in the Toyota Atlantic series' 30-year history - debuted with a solid third-place finish. And Kenny Brack, a veteran 37-year-old Swede, placed fifth in the Indy Racing League's event Sunday in Phoenix. Rahal believes Breuers has the right stuff to join that trio, especially in teaming him with Patrick on the Toyota Atlantic circuit. "I had seen Marc last year and he was always at the front end of the grid," said Rahal, who watched Breuers' victory last August on the Mid-Ohio Sports Car Course. "That's a tough [racing] category because you're not allowed to do a whole lot to the cars. It's really up to you as to how you can drive them." Rahal hadn't originally planned on a two-car entry in the Toyota Atlantic Championship, but the talent and determination of Breuers, an Episcopal Academy graduate, made him reconsider. "In looking at potential drivers, we identified Marc as one of the people who would be able to work with Danica - and she with him - and the two of them with our engineering staff. On all fronts, if everything works out with the sponsorship, Marc certainly seems to be a guy that qualifies." Breuers, who made the trip to Monterrey last weekend to iron out the deal with Rahal, came away confident that he had made an impression. "When Bobby saw me run last year, I think he saw that not only in the car was I doing well, but out of the car I was very professional, hustling and building a reputation for working hard," Breuers said. "I think he's willing to take a chance on me." Breuers was also impressed with Patrick's performance in Monterrey and would welcome the opportunity to partner with her. "I think she did a great job, she ran competitive times with the front-running cars throughout the race. It'll be interesting to team with Danica," Breuers said. "I would certainly hope that we'd be competitive with each other. That's what drives you to become better." In the meantime, he has met with Team Rahal's business-development manager and has lined up potential sponsors, hoping to entice what he refers to as "locally based national companies" to come on board. Breuers carried sponsorship from Philadelphia-based Sunoco last season. "It would be really cool if I could go to a Pep Boys or Comcast and say we can do something for a relatively little amount of money." Contact Pete Schnatz at 215-854-5817 or pschnatz@phillynews.com.